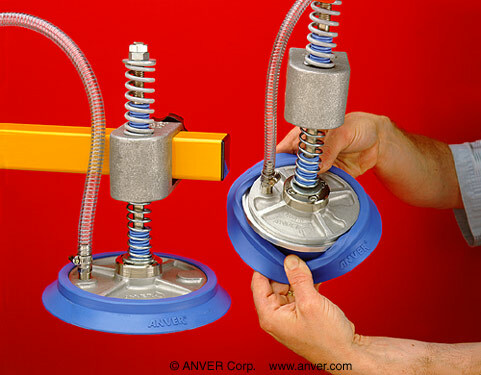 A new line of universal vacuum cups that can be changed in the field, without tools, in under a minute, for handling flat products in virtually all automation, pick-and-place, and material transfer systems has been introduced by ANVER Corporation of Hudson, Massachusetts. ANVER SSR Series Vacuum Cups feature an aluminum pad with a machined double-wall groove and a rubber sealing ring that snaps into place by hand and can be installed in under a minute. Unlike conventional bonded cups, this snap-in design eliminates the need for tools, clamps, or screws that can fall into machinery and the metal pads no longer have to be discarded, substantially reducing replacement costs. Featuring an inside safety sealing edge, ANVER SSR Series Vacuum Cups are available in standard blue neoprene, silicone, gum rubber, and other specialty rubbers. They come in 4″, 5″, 6″, 7″, 8″, and 9″ diameter sizes and are offered with complete ball swivel vacuum cup suspension systems.